The Robinson family: mother Kylie, Havana, 1, Kalani, 2, and Eddie on Soul Food Farm. In 2017, Eddie and Kylie Robinson and their children moved to a 90ha dairy farm for a live-in farm manager job, with the proviso they could lease half an acre of the farm to start a market garden venture of their own. 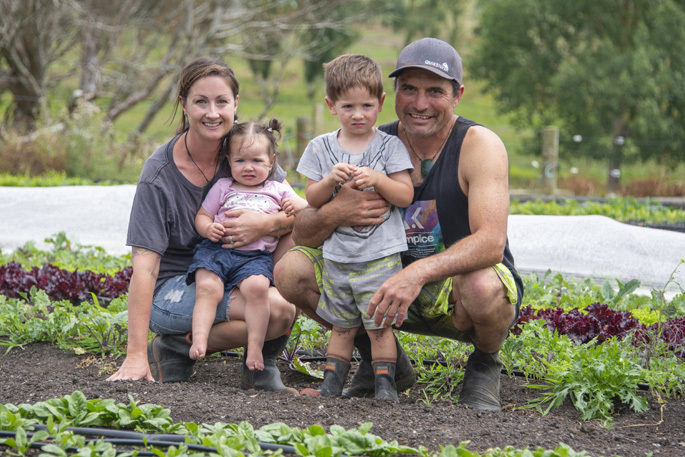 Ex-chef Eddie, 41, and Kylie, 36, a full-time mum to Kalani, 2, and Havana, 1, had a dream to expand growing their own veggies into a business to provide fresh produce for their community. Friends of the couple, Justin and Vinnie Gold, joined them as business partners. The flat area of bare paddock was covered in tarps for a couple of months to kill the grass without the need for chemicals. “The land was then turned over with a big rotary hoe, and we trucked in 30m3 of organic compost,” says Kylie. Beds were formed and an extensive irrigation system was implemented. Two 20m by 5m polytunnels were erected and a 40-foot container was brought in to use as a washing and packing shed. Although not certified as organic, the couple will not be using chemical products in the soil or on the crops, and their packaging is environmentally-friendly. “We will just top up the beds with organic compost as we need to,” says Eddie. After some issues with flea beetle and slugs, they are trialling fine micron netting which should cut out the majority of pests. Growing quick turnover crops also makes it harder for pest habitats to establish, and makes better sense financially, says Eddie. The Raglan community has quickly backed the venture, with local cafes The Shack, Wallis Bistro and The Wharf, and The Herbal Dispensary stocking the seasonally-grown produce. “People like knowing where their food comes from and there is a huge following of organic practices,” says Kylie. The business requires around 40 man hours a week, with Eddie doing early shifts before his farm work, and Kylie taking the late shift when the children are asleep. “It’s hard work but we believe it will all pay off in the end,” says Kylie.